Nestled among the rolling hills of California’s beautiful Capay Valley, Cache Creek Casino Resort is an oasis that offers visitors a perfect blend of nature and entertainment, relaxation and excitement. 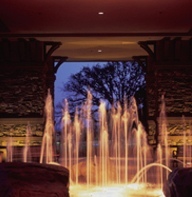 Cache Creek Casino Resort is truly a world-class destination. Owned and operated by the Tribe, the Cache Creek Casino Resort is our primary business enterprise and is a major economic engine in Yolo County. As the county’s largest private employer, this business not only provides the Tribe with economic security, it also provides wages and benefits for the families of approximately 2,350 employees. The 415,000 square foot property includes 94,000 square feet of casino space featuring 2,350 slot machines and 120 table games. It also includes a 200 room luxury hotel and spa, nine restaurants, an entertainment venue, outdoor swimming pool, casino gift shop and tribal-operated mini mart, gas station and fire station. Adjacent to Cache Creek Casino Resort is the Tribe’s renowned Yocha Dehe Golf Club, which includes an 18-hole championship golf course. Cache Creek Casino Resort buys tens of millions of dollars in products and services from local businesses, including produce and meats from local Yolo County farms, and it has launched a new program to showcase these foods in its first-class restaurants. When patrons visit the resort, they are able to enjoy all of the bounty Yolo County has to offer. We approached the development of the Cache Creek complex with a vision that it should reflect our Tribal values. This complex demonstrates our Tribe’s respect for the land as well as our desire to provide neighbors and visitors with a magnificent valley experience.